Home > Review > Video Tour: Our 2013 Salsa Vayas! We’ve been riding the sweet 2013 Salsa Vatya frames for a while and have been dialing in the fit and components. Here’s a quick video tour of how we built them up. There are a few differences from the stock build. We wanted lower gearing than the cross double provided so we are running a 42-28 mountain double. Laura wanted to still shift friction so we set her up with some Paul Thumbies. We’ll post a more comprehensive component list soon, but for now enjoy the video! Why the end of the affair with Brooks saddles? Wayne. We’ve gone through 3 Brooks in the last 4 years. They just don’t hold up like we like and are tired of having to baby them and constantly worry if they are getting rained on or too wet. We’ve found that they break in and there’s a great honeymoon period when they settle into your sit bones…then it is down hill from there. They continue to sag and soon you’ve got a ridge poking into your privates. Tightening the bolt doesn’t raise the sag it just stiffens the ridge. Of course all anatomies and taste varies so for some Brooks is great. But for us, we’ve given them a fair shot and find that in the long run they don’t work for us. The Charge saddles we are using are about just as wide sit bone-wise and are lighter (and only cost $25!) and we don’t have to worry if they get wet. Not that surprised on your going off brooks on what I’ve read from Jan Heine and others. Seems their quality control has gone downhill. Thank you for giving your impression, has a lot of weight for me considering the miles you’ve put in on them. I got the Velo Orange equivalent of the B17 and is going well so far, so hope that might be one of the possible solutions. 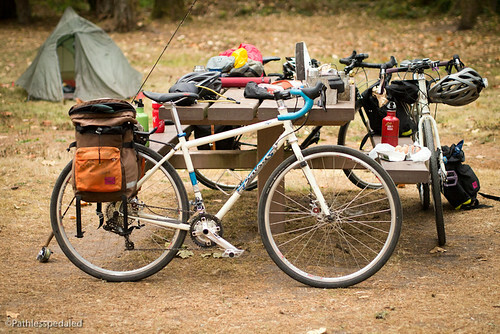 Philip – we’ve ridden the Velo-Orange equiv of the B-17 and actually prefer it to the Brooks. Leather feels stiffer and it has a coated bottom that slows the over breaking in of the current crop of Brooks. What was the problem with the disc brakes? I could not hear that one (or maybe it is some term I have not heard before). Thanks! Russ, can you do a comparison with the LHTs? Mention why you changed, or something. “Because it’s new,” is okay, but I assume it’s also to do with different kinds of riding too- smaller trips vs. cross country. Point out the strengths of each, things you’ve learned how to cope with, etc. Also keen on a comparison with th LHT’s, tx. I have to agree about the Brooks saddle but for different reasons than above. After following all the break in tips and then ridding 3k+ miles cross country on it just never broke into that great saddle that everyone loves to tout. At $100 bucks its just not really worth it to me. I will be curious to see if you stay with the discs, their high maintenance and announce has always been too much for me, plus their cost of replacements pads is over double than that for a F150 pickup (just not right for what you are buying). With the front double size do you find you are spinning out of gears on the top end? I will be curious to see if you stay with the discs, their high maintenance and annoyance has always been too much for me, plus their cost of replacements pads is over double than that for a F150 pickup (just not right for what you are buying). Disc brakes are great. A set of new pads is under $20. Is that a lot? And what maintenance? What annoyance? Just turn the knobs every few months. I’ve been commuting daily with BB7s for three years and they still work great. Other than new pads once a year they don’t need any maintenance. Just wanted to thank you guys for a great site. I did my solo tour in the summer of 2010, and I believe we have mutual friends in the form of Warmshowers hosts in Bryson City, NC. My loaded bike (Trek 520) and I weighed close to 275 lbs, and even through the Rockies, Ozarks, and Appalacians, I never felt like I needed more stopping power; my caliper brakes worked just fine. Have to respectfully disagree on the Brooks saddle–mine served me so well that I got another for my second bike. Anyway, I’ve got my own blog as I finish up my book about my ride. It’s at http://www.queasywriter.blogspot.com. My latest update there is all about touring and dogs (getting chased by them, that is). I’m glad a blogger has the balls to say this about Brooks saddles. Thanks for the honesty. It’s all hype, I say. They’re not worth the price. Maybe they used to be better but now their quality is questionable. I’m on my second one. The first one (B17) felt like a piece of 2×4 after 400 miles with plenty of care and maintenance as required. The Brooks rep said I may need 1000 miles to wear it in. Are you kidding me? Got rid of that one quickly. The second one, B17 Imperial with cutout, is more comfortable but the cutout edges curl up slightly and I can feel them unless I wear biking shorts with chamois. It also had sharp rivets that I had to file down. It’s a joke at $120. I own WTB saddles with leather tops that lasted me thousands of miles without any visible wear, they feel very comfortable and they somehow don’t mind getting wet. This is the last Brooks saddle I will ever touch. What happened to the Bromptons? After riding some gravel and getting a taste of mountain biking, we are looking to do more mixed terrain touring in the future, which the Bromptons wouldn’t be able to handle. We still love and ride them, but are switching gears so to speak for touring at the moment. Something has happened to the density in Brooks saddles there is no doubt. Turn to the Cardif saddles as they have a waterproof underbelly but there break in time is a bit longer. What type of front derailleur are you using? Did you have to make any adjustments to make the SRAM x5 crankset work? Chainline problems? Thanks. Another Vaya rider here. I built mine up using mostly parts I had on hand – photo at http://2224.home.comcast.net/JacksonLakeOct2011/JacksonLake27.jpg – with a couple changes since: Terry Liberator Y saddle, Panaracer Pasela 700×37 tires. It’s a terrific touring bike. As a longtime downtube shifter guy, one of the Vaya’s selling points was that I could use them. This caught my attention as I’ve not been completely satisfied with the two B17s I’ve owned. Which model(s) of Charge saddles are you using? Russ is using the Charge Spoon…has a great history of good reviews. Laura is using the women’s specific Charge Ladle. They are a little different feeling from the B-17s but are really supportive and DON’T sag. That has been our problem with the B-17s in the PNW. They get wet and they sag and no amount of bolt tightening fixes that. It seems like the quality of leather has gone down hill as well and is no longer as tough? Even within the last decade since we’ve been riding bikes, we’ve noticed a change in leather thickness which maybe has something to do with the sag prob. What front derailleur are you using on your Salsa Vayas? Just curious. Thanks.